Walking Trolley Height Adjustable And Robust. It has an almost endless list of uses and can be used either with or without the clip on plastic trays. The trays themselves have rails to prevent you from losing items off the edge. 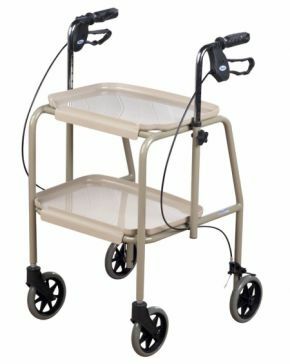 The lockable loop brakes provide the support and stability that you demand from a walking trolley, and will make sure that the walker stays where you want it to - a necessity when getting up from a seated position. Excellent product easily put together and delivered in super fast time...will recommend! 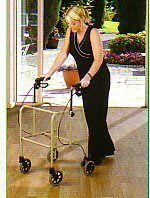 Bought for mr mother with severe arthritis. 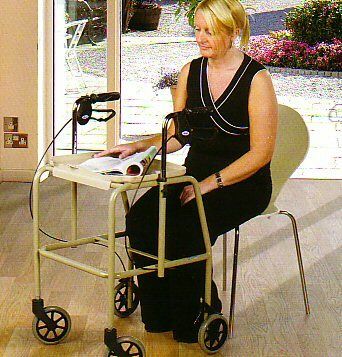 Brilliant - sturdy, easy to manoeuvre and light. Wide enough to hold average sized tray so requires corridor space for passage. As it is at my mother\'s house house I can\'t state the width. Strongly recommend.